Imagine what it would be like to wake up every day happy and full of enthusiasm for what the day will bring. Imagine if this was your reality every single day. Just the peace of mind would be phenomenal, let alone the feeling of security. Instead I imagine you’re tired, frustrated, and apprehensive about your job and your retirement. Maybe you don’t have to imagine it. Maybe it’s where you ar right now. You might even be at the point of open fear, like I was. If so, you’re not alone. In fact, most professionals and senior corporate executives are in the same place as other American workers. Most people’s dreams of a secure retirement are gone. You just have to pick up any paper or magazine to convince yourself of this. You may think you need to just stay on your course to pay the mortgage and feed the family. You’re trapped. There is no hope. But this isn’t the whole truth. Managers, professionals, and senior corporate executives were led to believe certain assumptions when we signed up for our 40-year career paths. And most people’s plans conform to a set of assumptions made a long time ago that are no longer true. Ask yourself how you really see that plan working out for you. Do you have retirement cash flows that will support you for thirty years in a nice lifestyle? Not many of us do. So, how do you get out of this situation? How do you start on a new path that will get you to where you always dreamed you would be? How do you take control of your financial future? What can you do today to be happier and more empowered? How can you get to the life you dreamed of with an income that supports it? Don’t worry if you can’t answer these questions yet. This is where I can can really help you. You see I truly believe that each of us has an opportunity to leverage our professional and executive skills and experiences to create a new life in today’s economy. When those skills are organized and applied they can give us back the dreams we had. You don’t have to accept the assumptions you were told to make. That’s why I created Retirement Rehab—to empower you with the exact steps to have the retirement you deserve while doing the work you love and having total control of your own destiny. 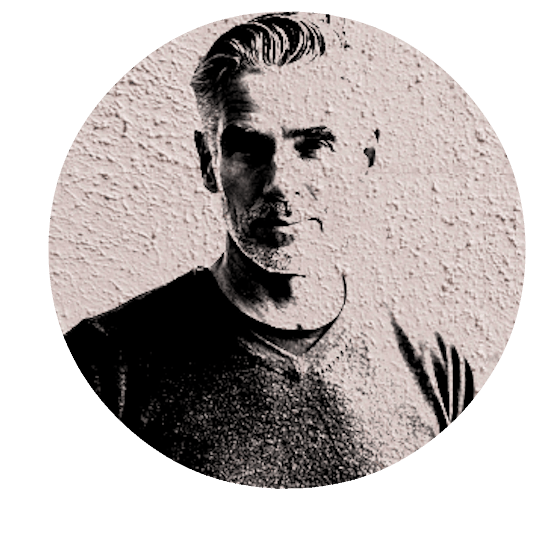 My name is Ian Bond and I’m a proud senior corporate executive and entrepreneur. I’m also the creator of The No Nest Egg Retirement Plan. I’ve spent the last 5 years struggling with this exact problem while working in a job that once provided well for my family and that I actually love. 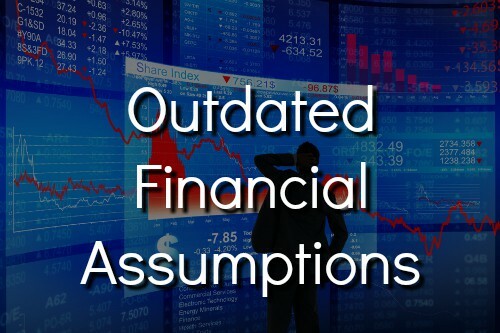 The problem is that in 2008 the whole financial equation changed for me and turned my finances upside down. I didn’t know what to do. I was staring at a financial abyss. I am a wealth management senior executive with over three decades of experience having worked for Goldman Sachs, Credit Suisse, Citigroup and others. Today I live abroad and work for another international bank as Head of Private Banking and Asset Management. After the financial world collapsed in 2008, so did my own. I lost about 60% of my earnings, but I was one of the “lucky” ones—because I still had a job. I was hemorrhaging money as my expenses were geared toward Bull Market earnings. By the end of 2011 my earnings had bumped up a bit although they were still far from pre-crisis levels. I had also borrowed as much as I could. So, I was deeply in debt and still very cash flow negative. You see, while my employer’s business had rebounded nicely, the company didn’t pay me like before. My industry had changed forever. As a dedicated corporate executive warrior I didn’t know where to turn. As I was in my 50’s I was painfully aware that my job could end any day. My plan had been to use these years to put my kids through college and build a retirement fund. My plans had spiraled out of control. My whole identity was wrapped up in the persona of the big corporate job I had. I had no one to talk to. My friends never spoke about their personal finances. I certainly couldn’t risk talking to colleagues or I could lose my job. I had also morphed into a quick tempered husband who griped about even the smallest expenses. My wife noticed the difference and wondered who I had become. I felt totally out of control of my own destiny for the first time in my life. Then in 2011 I heard the words of an inspirational speaker talk about becoming a “victor and not a victim.” When I looked at myself honestly I had lost discipline and my habits were poor. I was behaving like a victim. I needed to reinvent myself. When I was just starting college my father went broke. I watched him sharpen his resolve, lose 30 pounds, and focus all of his efforts like a laser. We moved from a very large home where I had grown up to a much smaller place in a much less elegant part of town. My father told me later in life that he would be “the last man standing” but never let his family down. So I dug deep and remembered what it was like when I was a rookie on Wall Street. In those days I went to the office while it was still dark out. I stayed late. A senior colleague once told me I would have to work 18 hour days for 3 years to even compete with his knowledge. So I made it my mission to put in this kind of effort. If my job wasn’t going to provide for my family—or if my job suddenly ended—I needed something to supplement or replace this income. 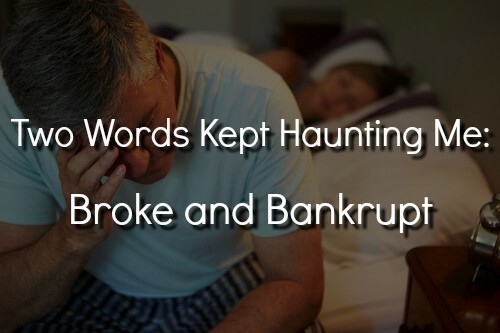 “Broke” and “bankrupt” and “last man standing” were my motivators. When I took stock of what I had going for me – and looked outside my immediate corporate surrounding – I was quite pleasantly surprised. I was really pretty amazed at what is out there. This is one of the things that just doesn’t get talked about for people in our situation. As a senior corporate executive in charge of a wealth management business I had two huge advantages. First, I have looked at thousands of different investment opportunities from scores of investment managers over three decades. I know the operating levers in these investments cold. I know the good ones from the bad ones. I know how to scale a business. Second, I have managed people at a high level for a long time—as many as 3000 at once. I know how to write strategy and structure its implementation. I know how to construct policies and standard operating procedures. I can do this in my sleep. I was more than a little shocked to see people struggling with even basic issues in these areas. My big corporate training made it easy for me to see opportunities in the entrepreneurial world where I could exploit these two advantages in my spare time. I just needed a specific vehicle to leverage to make it work. My new strategy would take enormous discipline but I determined it was definitely doable. But what would be my “vehicle”? I made a decision to invest in myself in a very big way while I still had a job. I bought thousands of dollars in courses on how to make money away from the corporate world. I read books. I religiously listened to numerous podcasts on startups and audio books. One of the perks of my job was it afforded me the opportunity to see a lot of new technologies early. Some I understood and many I didn’t. But I became more convinced of the tremendous opportunity available as I learned more about this New Economy. I realized the same trends and technologies that were putting pressure on people’s salaries and careers, were also the trends and technologies that could build a durable retirement for me! I couldn’t contain my enthusiasm. Figuring out where I could maximize my skills became my new passion. However, I still had to overcome my biggest enemies–time and money. I didn’t have 10 years to execute a retirement plan, which is the minimum traditional planners recommend. Traditional planners also only deal with investing a pile of money to fund a reduced lifestyle for retirees. But I knew I could create a way to fund my strategy. This would be painful and require a change in my lifestyle, but it would also set me up for a solid, rewarding retirement. One big detail haunted me – I also had to tell my wife. 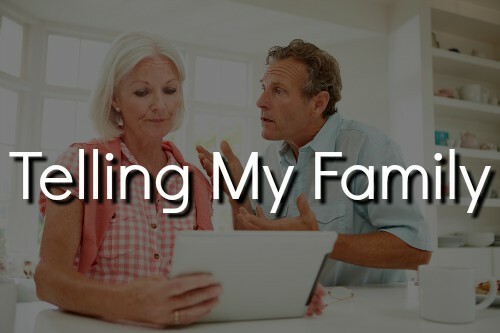 In our family I had never really shared our financial details. My wife had built up expectations and so did my kids. We had a circle of friends that lived where things like private schools and exotic vacations were expected. We had friends that regularly spent the summer in expensive homes they rented. They skied in the winters at great resorts. The dinner parties were extravagant. Everyone was always decked out in designer clothing. The change we needed to make to our burn rate was going to be obvious in our new lifestyle. While my wife was never as affected as many of her friends, I really feared the worst from this conversation. My plan was to get busy improving myself and “walk the talk” before I opened up to my wife. I radically changed my habits and behavior so that my wife saw a new me. While I had feared “the Conversation,” my wife understood immediately the gravity and helped accelerate the process. So we began to re-engineer our life. I began by radically overhauling our expense burn rate. I shed all notions of what I was “entitled to”. I became obsessed with ways to live richly on a vastly reduced budget. I benchmarked my costs every time I saw a study in the press. First I cut my housing costs by 40%, then I built up a Disaster Fund. But my retirement was definitely not yet safe. Simultaneously through the courses on the “New Economy” I became fascinated with the growth and ease of access of new technologies. The very same factors that had destroyed the economics of my industry were propelling other huge opportunities. I could make money using these technologies and my corporate skills. I was certain of it. And I turned out to be right. Fast forward to today and I can honestly say my retirement is more secure than ever. But this wasn’t the kind of retirement planning advice from the traditional planning industry. First traditional retirement planning is all about the “4% Rule” of spending your savings. Today people don’t have any nest egg. The game is changed forever. It’s now all about CASH FLOW. Second, traditional planners assume you have a safe job and steadily increasing income until retirement. I know because I have run these businesses for my employers. Today these kind of assumptions are laughable. Let’s be serious. 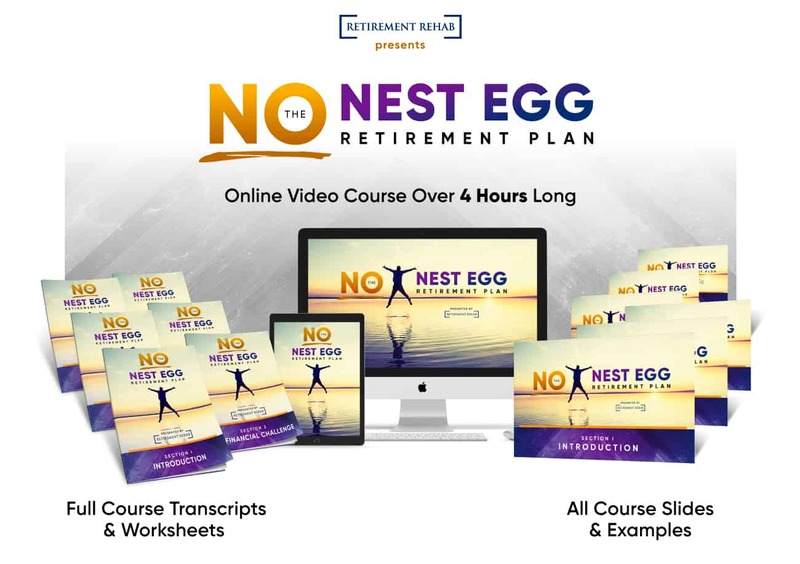 My corporate executive experiences, my frustration with traditional retirement planning, and my success at changing my own future led me to create The No Nest Egg Retirement Plan. The The No Nest Egg Retirement Plan is entirely different from everything else in the market. This is the only plan I know of for manager, professionals, and corporate executives in dead-end situations. 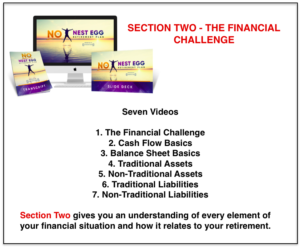 The No Nest Egg Retirement Plan focuses on people with no nest egg that will need cash flow in retirement. But this cash flow is going to have to come from someplace other than their corporate job. In my career I’ve worked with the best advisors, investors, and asset managers. I have literally reviewed thousands of investment opportunities in my day job. Never in my entire wealth management career have I seen anything like what I offer in The No Nest Egg Retirement Plan. Not in any of the expensive coaching programs, not in any bank I have worked in. Conventional planners work with big piles of savings and the 4% Rule. The No Nest Egg Retirement Plan flips this and leverages your experience and skills to build real and durable cash flow. The kind of cash flow you can count on being there to spend when you retire. So nothing from the traditional world comes close, because nothing is so deeply rooted in the strengths experienced people naturally possess. Also, no plan addresses the deeply personal issues a lifetime professional or corporate executive faces when his world has changed. It’s ironic those same skills are so precious outside the jobs those execs are so terrified of losing. It’s a tragedy that executive warriors try many ways to numb the pain they feel as they lose hope in their future. They have had no resources to help them . . . until now. No one else offers the specifics of how to create income streams on the side, even when you can’t afford to lose your job. No one offers strategies to lengthen your career and keep your income at a higher level longer. Traditional financial advice is not savvy in these topics. They need products to sell. What I’m talking about are new concepts and there is no formal training for traditional advisors to take. They can’t offer tailored advice that is this specific. This advice just can’t be mass-produced. The No Nest Egg Retirement Plan will deliver for you a set of concrete, measurable outcomes to insure you’re set to transition from the employed world when the time comes. Irrespective of whether it’s by their choice or yours. The No Nest Egg Retirement Plan is intended to give you immediate peace of mind. I am someone who understands your concerns and have lived through the journey you will take. I’ve been through the whole range of emotions you may be going through. I have counseled many people and helped them through the Retirement Rehab process. I found ways through my own trial and error to persevere and succeed. The motivators of “broke” and “bankrupt” were huge in getting me to change my entire mindset. This is the single most important first step to take. You can use The No Nest Egg Retirement Plan to accelerate your progress. You can cut years off your experience. You can also save the tens of thousands of dollars that I spent. You can have peace of mind again. Living afraid every day is no way to live. That stops here. 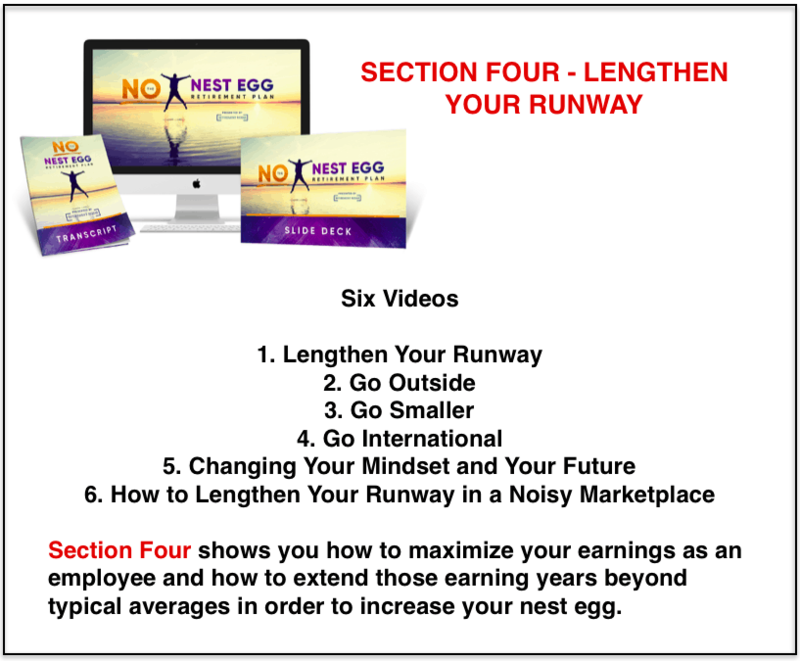 The tactics and strategies in The No Nest Egg Retirement Plan could easily be worth 7 figures to you. If you know anyone in their 50’s who was let go from their corporate job and was unprepared, you can’t disagree. Go ahead and ask someone in this position what he or she would have spent to have been better prepared. You can’t afford not to put these strategies to work today. You will get an in-depth perspective on strategies in real estate, private businesses, and paper assets like stocks and bonds. The first two—real estate and private businesses—may offer an opportunity to develop an outside income stream. I will guide you through an analysis to see if these are right for you given your vision of your Perfect Day. If an investment can make money, I have likely looked at it already in my day job. You can benefit from this perspective. I condense over three decades of experience in dealing with countless families in these matters. After discussing how wealth has been traditionally created, we accelerate into the new areas of how enormous wealth is and will be created. This New Economy is undoubtedly the “Opportunity of a Lifetime”. All of the technology and globalization trends are combining to offer rich rewards to those bold enough to participate. These are the same trends crushing the souls of office knowledge workers and shortening executive careers. Senior corporate managers and execs have the most pertinent skills to capitalize on this right now. This is how you will make enough money every month to retire in style. The No Nest Egg Retirement Plan will arm you with the exact knowledge you need to take advantage of this opportunity. I show you exactly where to go to find these deals. These are reputable places only very savvy people know of. I will even help you evaluate the deals. Just ask me! The key here is you will be in control of your own destiny and not some boss on a higher floor. Choose how active or passive you want to be. There is no cookie cutter solution here. You decide. People I have helped have made their own choices on how much they need and how involved they want to be. You will determine what will be best for the lifestyle you want. 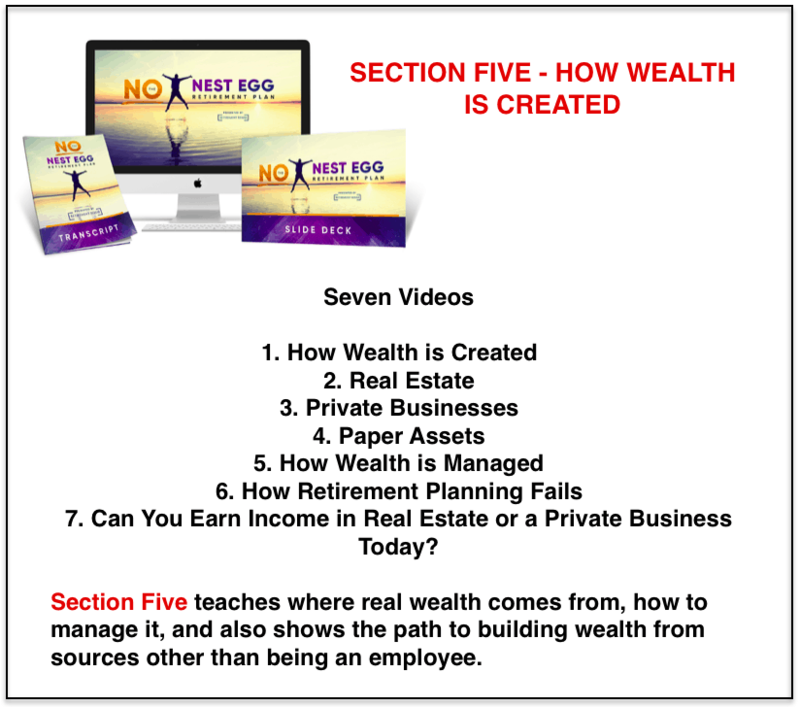 With The No Nest Egg Retirement Plan you will learn about this new world of and you will become as passionate as I am. Today I am so much in control of my own destiny, I can scarcely remember those days of sheer terror about the financial abyss I faced. You too can build real durable cash flow from multiple income streams and live life on your own terms. The No Nest Egg Retirement Plan strategy framework will be the foundation of the most important decision for your future retirement plans. I cannot express to you how liberating it is to earn dollars from a source where they cannot fire you. The first time a deposit hits your account you will wish you had executed this plan 5 years ago. And it’s entirely true that it happens even while you sleep. This is the retirement you dreamed of but can no longer attain on the path you’re on. This is complete control of your own destiny outside a corporate structure. This is an income stream not dependent on some boss and his opinion at bonus time. Are you willing to choose a new and proven retirement process over your old plan? I have made it super-simple to take the first step toward a better life. 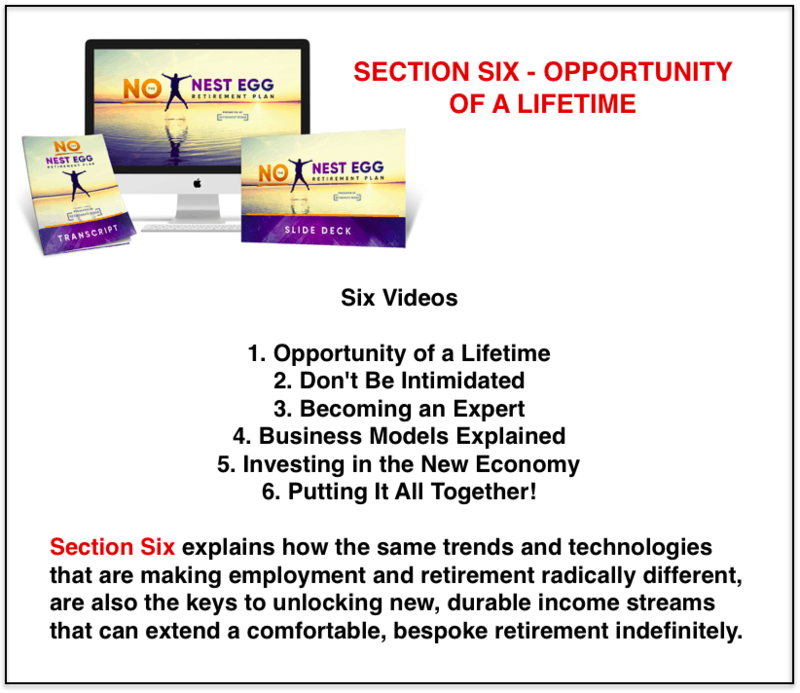 After you become a member you’ll instantly get access to the entire The No Nest Egg Retirement Plan where you will begin your journey to a fulfilled life that you control. Making an investment in your future can be a scary thing—it’s a commitment to creating a better life. But if you don’t make a commitment what will your life look like a year from now? My guess is it will be worse than today because we are all aging and time is our worst enemy. Don’t let more time slip through your fingers. Purchase The No Nest Egg Retirement Plan today. Look, I want to make it very clear to you right now that if you’re feeling trapped in your current situation or scared of where you’re heading, you need a new Plan. I know I did. You need to change your mindset and stop “believing” what was hard-wired into all of us who bought into 40-year careers. In fact, I’m going to go so far as to say it’s your responsibility to yourself to do this. Because you have enormous skills and experience and today’s economy is screaming for you to be bold enough to leverage them to your advantage. You have limitless opportunities to build something that you control and that does not control you. Because you can be totally free of the drudgery of corporate life and command your own destiny. So why don’t most people grab onto these opportunity and run with them like there is no tomorrow? They don’t know where to get started because professionals and corporate executives don’t think like entrepreneurs. They think like employees until that fateful day comes when they are shown the door. The industry is against them. There is a huge multi-billion dollar retirement planning industry selling the “work 40 years and then retire nicely” on a set of high fee financial products. Nobody else has tailored an alternative for them. They lack knowledge. I have pulled together over 3 decades of experience across several wealth management disciplines and combined this with cutting edge New Economy opportunities. Maybe this will be mainstream someday, but sadly it isn’t so today. I’m here to tell you straight. Don’t just sit back and let life hand you something you never wanted. Wake up! Please get up and do something! I know it’s not easy and you may have tried other things and failed. Life is difficult. Don’t let that stop you from making your dreams a reality. Don’t accept the status quo. Fight against it. Fight for peace of mind and a retirement you deserve and control. There is no better time than now to choose to invest in yourself. If you choose The No Nest Egg Retirement Plan, then I look forward to meeting you and working with you to achieve all of your goals and dreams. I have helped so many people change their mindsets and their lives, so I’m confident you will love my The No Nest Egg Retirement Plan too. Membership is month to month with no contract or commitment by you. Quit at any time for any reason. If you are not absolutely thrilled with the wealth of life-changing information or your progress through The No Nest Egg Retirement Plan, I’ll refund your first month with no questions asked. This is really a risk free proposition. Undecided or still got questions? Check out these FAQs. How much time do I need to commit during the program? You need 60-90 minutes per week to get the most out of the course. However, you can take it at your own pace. Some people complete the course in 6 weeks, others take several months to work through things on their own terms. The Lessons are 3-10 minutes, so you can chunk your time efficiently. Most people go back over concepts after an initial run through, which I encourage. In short, you need to block out 20-30 minutes in your calendar only 2-3 times a week. If I’m just about to retire is it too late for me? No! Your timing is perfect. The No Nest Egg Retirement Plan can give you some alternatives to extend your higher paying years while you build a situation that provides durable cash flow that you control. It’s not too late! I already have a couple of things going on the side. Can this help me? Absolutely! You can turbo-charge your current activities and make sure you’re on the right track. You will gain a whole new perspective and learn a ton of valuable lessons. Do I need to have business or financial experience? No! 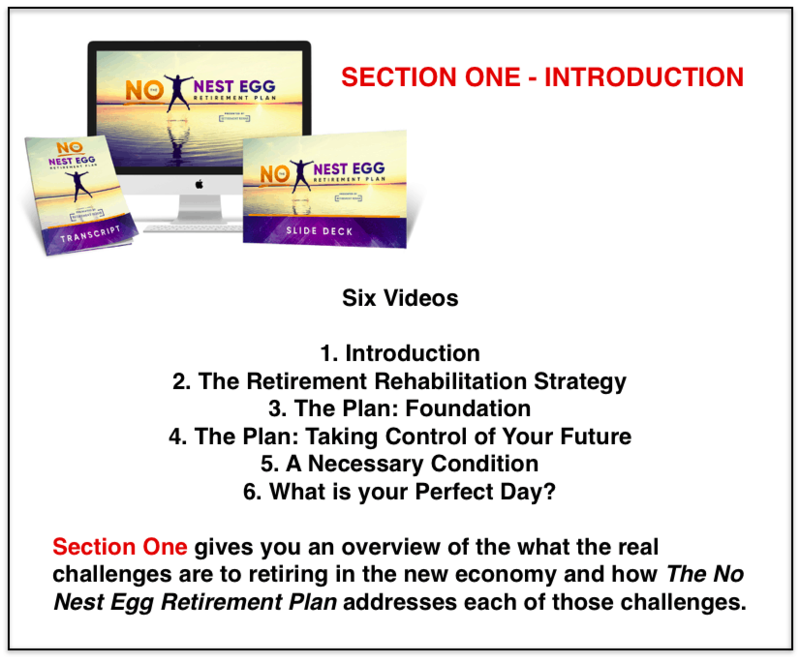 The No Nest Egg Retirement Plan is expressly designed to get those willing to change their mindset and put in the work into the right entrepreneurial activity to be aligned with their Perfect Day. Don’t worry about business ideas or experience. The Plan covers that. I want the life you describe but I am in deep financial and career distress and don’t see any real way out. Should I wait until the future is 42more certain? Absolutely not! 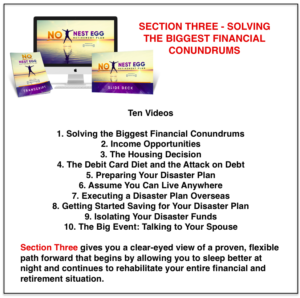 The No Nest Egg Retirement Plan will exponentially accelerate your progress. It was created specifically because there are no professionals to help people like us get on the right path. It will create the certainty you seek. Originally this program was planned to sell for over a two thousand dollars. Even then, I believe it’s worth ten times that. But to make it accessible to the maximum number of people, we’ve made it all part of a very low cost membership community. At this low monthly price, I would ask whether you can afford not to. I don’t brag about spending tens of thousands of dollars on courses, but I have. Because I firmly believe in learning from experts. I use them for legal, tax, and medical purposes without thinking. For online courses it is often just one concept that pays for the whole course. In my 50’s I don’t have time to be cheap. I need quick and proven results. I pay to skip the learning curve and leverage he people’s priceless experience. Special Offer: First month for $1, then just $27/mo.